Most medical doctors in a big city like Los Angeles believe that a person with a chronic disease or chronic ailment can't become well because they're "chronic." It's a circular reasoning fallacy. The word "chronic" refers to the duration of the condition, or disease. It has nothing to do with permanency, but the medical doctors can't get over their own beliefs. Instead of admitting failure to help a patient get well, they label the patient as "chronic." They believe that the patient can't get well, and conveniently absolve themselves from blame. Let's not call these doctors idiots, because they are otherwise people who know how to reason. However, let's understand that the doctor's strongly held personal beliefs about chronic conditions are largely based on the opinions of their teachers who had the same failure rate with their own patients, when they were in practice over 40 years ago. The myth of the chronic disease not being able to improve is part of a medical indoctrination, passed-down in medical schools, over many decades. Holding these false, passed-down beliefs is why medical doctors fail for their "chronic" patients. MD's don't have enough time to challenge their own biased beliefs. They have no time to investigate, or do any research on their patient's behalf due to their over-booked daily patient load. More than 50% of Americans have a chronic condition. A chronic condition is defined as 3 or more months with an illness, ailment, or disease. Chronic allergies are allergies lasting 3 or more months. Chronic constipation is 3 or more months of constipation. Irritable bowel (IBS)? You get the idea, right? 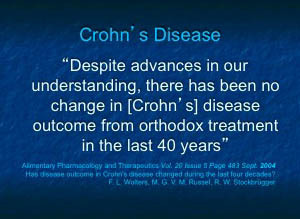 "Chronic" means the condition has been present for a while and that nobody has found the solution yet. It doesn't mean there is no solution for more than 50% of people who have a chronic disease! Many medical doctors have a problem communicating with you when they don't know the answer to your questions, such as: Is there any other doctor that can help? What else can be done? What about alternatives? Instead of answering these questions openly and honestly, and saying that they don't know, they tell you that nothing else can be done. Based On Experience With "More Of The Same"
You must understand that the doctor's myopic response to your inquiry is based on the doctor's limited experience, and limited knowledge. The doctor should be referring you to someone else to handle your care, but instead the doctor tells you his doomsday beliefs; that he thinks you can't get well. It is a guarantee to fail, if you would just follow his plan. When a medical doctor, who believes in old myths about chronic conditions, tells you he or she thinks nothing else can be done, you don't have to believe it too. You have to do your own research. 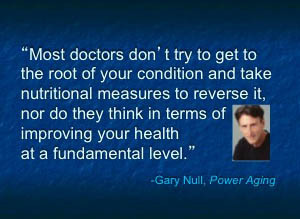 Know this fact: medical doctors have an inferior education regarding clinical nutrition, and functional medicine. Your medical doctor has no clue what else can be done outside of his or her own specialty (drugs and surgery). Your doctor may have blinders on, and you have likely never consulted with anyone other than an MD, so you don't realize that your doctor's opinion is just an opinion about chemical and surgical medicine; not a fact. 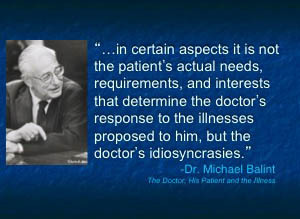 Remember, an MD who gives you the old myth about people with chronic conditions not being able to get better is basing that opinion on his or her own indoctrinated beliefs and his or her failures as a doctor (experience). Do you go to a doctor who only has treatments that will fail for you? I didn't think so. It's time to step out of the familiar types of medical practices you have frequented, and go to a doctor who practices with a scientifically based, alternative medicine model. Your new alternative doctor must use a different model of practicing, otherwise you will get more of the same. Your new doctor should use current science instead of old medical beliefs that were taught by medical school doctors from 40 years ago.